Cleber Massey's Blamed took the lead at the start and held firm all the way through the stretch in Saturday's G3 Royal Delta Stakes at Gulfstream Park, the second graded win of her career. The 4-year-old daughter of Blame, ridden by Irad Ortiz as the 4-5 favorite, covered a mile over the fast main track in 1:35.18. Appropriately, the winner was conditioned by Bill Mott, the trainer of the race's champion namesake. Mexican racing star Jala Jala, who won the Clasico del Caribe at Gulfstream in 2017, ran on well to finish second at odds of 7-1, ahead of the late-charging 8-5 second choice Tequilita. Ken McCarthy, longtime assistant to Hall of Fame trainer Bill Mott, was all smiles Saturday after Blamed registered a commanding triumph in the $150,000 Royal Delta (G3), a stakes for fillies and mares named for the three-time Eclipse Award champion and 2019 Hall of Fame finalist who was trained by Mott. With Mott at Fair Grounds to saddle Country House in Saturday's Risen Star (G2), McCarthy not only saddled Blamed but also assisted in presenting the trophy to winning owner Cleber Massey. Blamed, a Grade 2 winner in 2018, finished a distant fifth in the Jan. 26 Hurricane Bertie (G3) behind a victorious Tequilita on a sloppy track. The 4-year-old daughter of Blame rebounded on a fast track Sunday, opening up an easy lead that was never in jeopardy thereafter in the mile stakes. Sent to post as the 4-5 favorite, Blamed and jockey Irad Ortiz Jr. covered the distance in 1:35.18 to prevail by 1 ¼ lengths over Mexican star Jala Jala. Jala Jala, who captured the $300,000 Clasico del Caribe in 2017 and the $100,000 Copa Confraternidad del Caribe in December in her two prior races at Gulfstream, closed from mid-pack under Emisael Jaramillo to finish second in her U.S. graded-stakes debut. Tequilita, the 8-5 second-choice ridden by John Velazquez, saved ground after breaking from the rail post position and finished a neck farther back in third. Blamed dominated the 3-year-old filly ranks in New Mexico last year before joining Mott's stable and finishing second in the Oct. 20 Raven Run (G2) at Keeneland. The Maryland-bred filly won the Comely (G3) at Aqueduct in her next start to close out her 3-year-old season with four stakes wins from five starts. Sent to post as the 2-1 favorite for the Hurricane Bertie, Blamed showed speed in the slop before fading in the stretch. 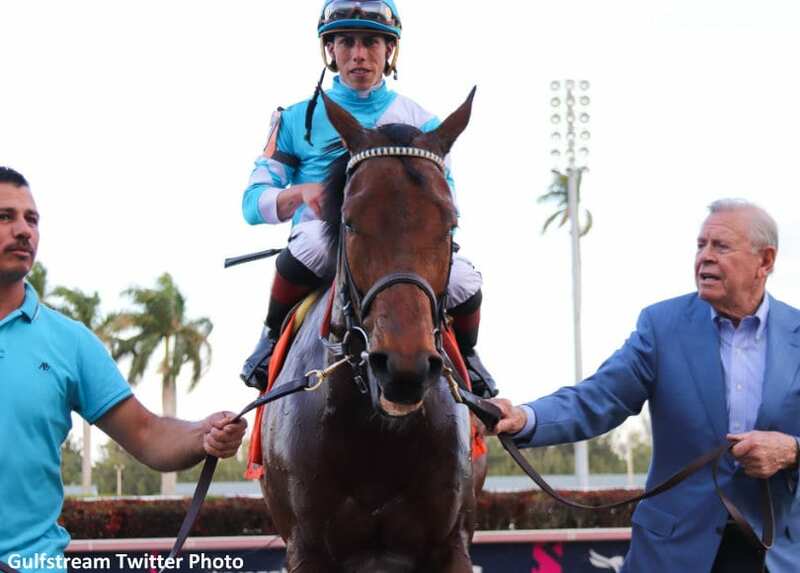 This entry was posted in Racing and tagged bill mott, Blame, blamed, Cleber Massey, Gulfstream, Irad Ortiz, jala jala, Royal Delta, royal delta stakes, tequilita by Paulick Report Staff. Bookmark the permalink.